Over the last few months, we’ve made several trips to Workshop, Charleston’s first “fancy” food court. Located on way, way, waaaaaaaay upper King Street, Workshop features a rotating set of kitchens – some there for the long haul (like Bad Wolf Coffee and Juan Luis) and others for a few short weeks or months (Beech Test Kitchen, we miss you!). From crowd- (and kid-) pleasers like Slice Co’s New York-style pizza to more exotic fare like Sambar’s Indian street food, Workshop’s varied restaurants offer something for every palate. With so many diverse dining options – not to mention ample free parking (a rarity in Charleston!) and a ton of indoor and outdoor seating – Workshop is a great gathering place for a group. So when we were asked to come up with a fun, casual spot to grab a bite to eat after a group tour last weekend, our recommendation was easy: Workshop and its six restaurants in one! Last Sunday, we joined about 25 fellow William & Mary alumni and guests (Tribe Pride!) for a really interesting and informative tour of the H.L. Hunley submarine in nearby North Charleston (locals, this is worth your time if you haven’t been!) before making the short drive over to Workshop. While we were a bit disappointed to discover that the very popular Juan Luis is closed on Sundays and that the Asian-inspired Slider Gold was only offering a limited menu that day, everyone quickly found food to their liking at Workshop’s other stalls. Sambar and the Vietnamese-focused Pink Bellies were the big hits of the evening. Sambar is a very welcome addition to Charleston’s limited Indian food scene, especially since its offerings are a bit more adventurous than the standard chicken tikka masala. On our visit, several W&Mers enjoyed the thali – a variety of delicious dishes served on a single plate. Perfect for sharing (though not quite large enough to constitute a full meal for two), Sambar’s thali plate comes with basmati rice, vegetables, sambar, green and mango chutneys, raita, dosa and a choice of pork vindaloo, coconut cashew curry or chicken curry. It’s a great introduction to Sambar’s cuisine, as is the “dosa and dips” (Indian flatbread served with a variety of chutneys and sauces). The lamb meatballs, served with curried lentil hummus, eggplant and cherry tomato masala, gingered turnips and naan, were another favorite, and we’ll definitely be ordering these again on our next visit. Pink Bellies offers Asian-inspired noodle and rice bowls topped with a variety of meats, onto which you can (and should!) add a delicious, 63-degree sous vide egg. The chicken thigh rice bowl and pulled pork-laden garlic noodle bowl are particular favorites – both offer heaping portions of perfectly-cooked rice or noodles topped with pickled vegetables and a mound of the meat of choice. It’s tough to go wrong with anything on offer. While several of the Workshop stalls serve alcohol, the selection is limited (though thoughtfully selected to pair well with their food). Luckily, Workshop is right next door to, and shares its outdoor space with, the newly-opened Edmund’s Oast Brewing Company. Our crew had no trouble ordering beer and wine at the brewery and bringing it back to enjoy at Workshop, making both spots all the more appealing. We can envision many more group gatherings in this great new space … we’ll definitely be back soon to work(shop) our way through its many offerings! Hi there – sorry it’s been a minute! Life (not to mention a jerk named Irma) has 86’ed a lot of our dining plans over the last several weeks. So while we’re working on new content (i.e., stuffing our faces around town), we thought we’d tell you about one of our favorite foodie experiences to date: the day-long market tour, cooking class and lunch we enjoyed last fall at The Cook’s Atelier in beautiful Beaune, France. Founded by an American ex-pat mother-daughter duo, Marjorie Taylor and Kendall Smith Franchini, The Cook’s Atelier is a small cooking school and culinary/wine boutique in the heart of Beaune. About a decade ago, Marjorie and Kendall did what so many foodies and Francophiles (us included!) have dreamed but not dared do – moved to the French countryside to pursue their passion for French food and wine (and help others enjoy it as well!). Kendall’s French husband has since joined the team and manages the wine shop and culinary boutique (and can make you a killer espresso! ), making The Cook’s Atelier a true family affair. We’ve been following The Cook’s Atelier’s progress for several years (we studied abroad in the south of France with Kendall in college), so we registered for a course as soon as we decided to make Burgundy the centerpiece of our trip to France last September. While the Atelier also offers dinners and multi-day courses, its flagship experience – and the one that worked best with our itinerary – is its “Day in Burgundy” market tour, cooking class and lunch. Offered on Wednesdays and Saturdays (market days in Beaune), the Day in Burgundy begins with a tour of Beaune’s incomparable open-air farmer’s market, continues with a hands-on cooking class in the Atelier’s copper-filled kitchen, and ends with a “long French lunch” in a beautifully-appointed dining room. Capped at ten guests, the day offers an intimate, informative and indulgent insight into Burgundy’s rich culinary culture. Shortly before 10am on a sunny Wednesday morning, we met Marjorie, Kendall and the day’s other guests in front of Fromagerie Hess, Beaune’s renowned cheese shop. Inside, we sampled a variety of local cheeses – including the infamous Epoisses, a soft, super-smelly cow’s-milk cheese – before wandering our way down the street to the farmer’s market. Despite its prominence as the center of the Burgundian wine world, Beaune is much more of a town than a city, and that community feeling was very evident at the market – everyone seemed to know one another. Marjorie and Kendall introduced us to some their favorite purveyors and artisans, several of whom generously shared samples with us. We’re still thinking of the incredible strawberries and expertly-cured meats a year later! Along the way, Marjorie and Kendall also purchased many of the ingredients that we’d use to prepare our lunch back at the Atelier. Upon arriving in the Atelier’s kitchen, we donned aprons and got down to business. Marjorie and Kendall explained each recipe and offered helpful cooking tips as we all lent a hand in preparing each dish; from chopping vegetables to preparing batter to piping madeleines, each guest took part in preparing the day’s meal. It was exciting to see lunch begin to take shape from the ingredients we had acquired less than an hour earlier at the farmer’s market. Once the gougères were baking and the beef was roasting, we headed upstairs to the dining room to enjoy the fruits of our (very mild) labor. Marjorie and Kendall handled the heavier lifting in finishing each course as we kicked off our meal a glass of bubbly. One by one the courses – all Burgundian classics – materialized on the beautiful zinc-topped dining table: gougères made with local Gruyère cheese, fresh tomato salad with basil, chèvre (goat cheese) and a balsamic reduction, an incredible Charolais beef roast, a large spread of cheeses from Hess, and an olive oil cake with wild strawberries and jam. The wine also flowed freely all afternoon; Kendall, who studied viticulture in Burgundy after college, perfectly paired each course with a bottle available in the shop downstairs. Though we were all started out as strangers, the shared love of food (plus, let’s be honest, the copious amounts of wine) made fast friends of all the guests gathered around the table. Since all good things sadly must end, we eventually said our goodbyes and headed back out into Beaune. We left happy, inspired, a little drunk and a lot full, though not so much so that we couldn’t stop back at Fromagerie Hess for a selection of cheeses and a bottle of wine to enjoy as a light dinner – you only live once, after all. Thanks to our son’s busy schedule (seriously, he’s only three but already way cooler than us), we usually find ourselves in Mount Pleasant for dinner one night a week. We typically rotate among a handful of restaurants (Kairos, Papa Zuzu’s and Five Loaves are our standbys), but this week we felt like trying someplace new. Scrolling through Yelp, we came across a well-rated place neither of us had ever heard of: Cinco Tex-Mex. Since we’re always down for tacos and Cinco was less than half a mile away, the decision was a no-brainer. As we learned from our server, Cinco opened early this summer with purposely-little fanfare. Run by a couple from San Antonio, the restaurant focuses on Tex-Mex classics – chip-and-dip appetizers, a handful of soups, salads and sides, and fajita, carnita, enchilada, quesadilla and taco entrées – all made to order. Cinco’s flour tortillas, which form the backbone of most of its dishes, are made from scratch and pressed in a small, glassed-in prep area in the dining room (a bit of a show with dinner! ), allowing the restaurant to demonstrate its attention to detail and dedication to authenticity. The drink menu tends toward Mexican beer and tequila-based cocktails, many of which are discounted during Cinco’s 5-7pm weeknight happy hour. We happened to be there on “Margarita Monday” and enjoyed a delicious, not-too-sweet peach marg for a mere $6 – reason enough to return! The food also helped secure Cinco a spot in our Mount Pleasant restaurant rotation. To start, we ordered the totopos con salsa – a heaping basket of house-made chips with red, green, and pineapple habanero salsas ($5). The red and green were good, but the pineapple habanero was great; the chile’s kick was accompanied by a burst of sweetness from the pineapple, which proved to be the perfect counterpoint to the chips. And the chips – ohhh, the chips. Warm, salty and fried to golden perfection, they were simply outstanding. Our server offered to refill our basket multiple times; we reluctantly declined lest we not have any room for our main courses, but it’s doubtful we’ll be so restrained next time! We will fight you for these chips. For our entrées, we ordered several tacos and the steak fajitas. The seven taco options are offered à la carte ($3-4.50 each), and we went with the asadero con rajas (cheese and pepper), beef fajita, and camarones (shrimp) – plus a chicken fajita taco for our son, who was none too pleased that he couldn’t have a chips-only dinner. The asadero and fajita tacos were a little underwhelming; the strong flavor of the asadero cheese overwhelmed the flavor of the sparse poblanos, and the fajita-based offerings were perfectly fine but nothing special. The camarones taco, however, was excellent, with nicely-fried shrimp, crispy corn salsa and a pleasantly spicy chipotle crema. We’d be curious to try the other taco offerings (beef barbacoa, chicken tinga and chorizo), but we’ll probably favor the more substantial entrées in subsequent meals at Cinco. Speaking of the larger entrées, the fajitas ($16-18) ranked right up there with the best Tex-Mex Tyler has eaten in Texas. The beef fajitas came to the table in the classic style: a sizzling skillet of beef, peppers and onions, a separate plate of black beans and elotes (Mexican street corn), and a foil pouch of the awesome house-made tortillas. The fajita fillings were all grilled simply but perfectly, and when layered into a tortilla and slathered with crema and pico de gallo, they helped showcase Cinco’s strength and potential. The black beans and street corn were also excellent, though both played second fiddle to the deliciously simple fajitas. Cinco does not offer desserts yet (though we hear some are in the works), but we were too full for more food anyway! We’re glad to have stumbled across this under-the-radar spot – it’s clearly still working out some kinks and refining its recipes, but we’re excited to see how it evolves and improves on an already-winning formula. Keep those chips coming, Cinco, and we’ll keep coming back! As we’ve mentioned before, we’ve kept a running list of all the Charleston-area restaurants we’ve tried since our first visit to the Holy City back in 2009. This summer, we realized we’d be hitting restaurant #200 right around our eleventh wedding anniversary in early August. So with some careful planning and unusual restraint (there are several new places we’re dying to try! ), we decided to go big and celebrate both milestones with a meal at the new McCrady’s tasting room. Billed as Chef Sean Brock’s idea of a perfect meal, McCrady’s offers only a tasting menu ($115), with optional standard ($75) or reserve ($160) wine pairings (or selections from a very extensive wine list), all served with laser-like precision over a span of exactly two hours. While we didn’t love every single bite of the thirteen-course meal and wished that certain aspects of the precisely-timed meal were a little more flexible, we found the experience to be an incredible foodie feast for both the eyes and the stomach. UNI CUCUMBER: The meal started with a beautiful frozen amuse bouche, perfect for a hot summer day in Charleston: a multi-colored, Lego-sized block resting on a single sheet of gold leaf, nestled in a bed of ice. This one-bite starter was a colorblocked combination of uni (sea urchin roe) and cucumber, dusted with togarashi spice and topped with a single circle of nasturtium leaf. While uni usually tastes like a big gulp of ocean water, this had just a faint hint of salinity that grew as the flavors developed in the mouth. The heat from the togarashi spice strengthened in line with the uni, both of which were nicely cut by the fresh coolness of the cucumber. This was an extremely cerebral bite of food that set the tone for the remainder of the meal: beautiful, (mostly) delicious, and some of the most technical food we’ve ever eaten. Wine pairing: 2016 MOVIA. PURO. PINOT NOIR BRUT, SLOVENIA. This delicious sparkling Pinot Noir is made just across the Italian border in the up-and-coming wine country of Slovenia. The bright red fruit flavor of old world Pinot Noir was well balanced with the wine’s crisp acidity, all supported by a backbone very reminiscent of a classic French blanc de blanc. BEET, COCOA, LIME: Served on a circle of short spikes, the beet dish resembled a piece of dark saddle leather but was essentially a grown-up version of a fruit roll-up. At first tacky and very sweet, the strip of beet was absolutely reminiscent of the childhood treat. The sweetness faded quickly as tobacco and chocolate notes emerged, and the actual flavor of the beet played a supporting role in the entire dish. If these were sold in stores, we would always have them on hand. Whimsical, delicious and perfectly executed. OSSABAW PORK, WILD RED BAY, SORGHUM: One long slice of heritage pork twisted around itself immediately brought to mind the serrano ham we ate almost nonstop on our recent trip to Spain. The pork was richly fatty, melting in the mouth in a sea of porcine delight. It was also glazed with a thin layer of sorghum syrup and dusted with wild red bay, both of which cut through the fatty unctuousness of the meat. This bite was classic Sean Brock in every sense, and we both wished the portion was much larger than the single beautiful piece we received. CARROT TART: Described by our server as being an “all carrot tart,” this was an interesting take on a combination of three preparations of carrot: the shell of the tart was a single slice of a large orange carrot (cooked to somehow hold the shell shape), and the tart filling was comprised of mandolined slices of raw purple carrot nestled within a carrot gel. While beautiful, this was probably our least favorite dish of the night. The tart was slightly too big to eat easily in a single bite, but it didn’t have the structural integrity to be broken into multiple pieces. (Tyler’s attempt at a second bite resulted in a hand covered in carrot pieces.) The pure carrot flavors of the shell and raw carrot were excellent, but they were sadly outmatched by the strong sweetness of the gel. We appreciated the incredible amount of work and technique that went into the tart but just didn’t love the end result. Wine pairing: PIERRE PAILLARD, LES PARCELLES, EXTRA BRUT, BOUZY GRAND CRU, CHAMPAGNE. This Grand Cru blend of Pinot Noir and Chardonnay was an excellent follow-up to the light sparkling red. Darker in color and weightier than the first wine, it nicely complemented the silky richness of the Ossabaw pork. SUNCHOKE, CLAMS: Next up was a dark, frosted glass bowl of sunchoke custard, topped with fried slices of sunchoke and a mystery green leaf (we forgot to ask what it was!). Hidden in the custard were chilled and glazed slices of Georgia clams. The custard was silky smooth with a very clean sunchoke flavor, studded with juicy slices of clams. The leafy garnish tasted exactly like lemon, which was a nice counterbalance to the richness of the dish as a whole. This dish was beautiful to look at and clearly cooked to perfection, but in our opinion it was one of the less successful plates of the evening – probably because neither of us is a big fan of either sunchokes or clams. MAGWOOD SHRIMP: Three small but exquisitely cooked shrimp, served in a pool of savory broth and surrounded by dots of a deeply roasted tomato sauce, were our next course. The shrimp, one of the standout components of the whole meal, were cooked better than any we’ve ever encountered elsewhere. The richness of the tomato provided a nice backbone to the clean shrimp flavors, all of which were pulled together by the slightly warm broth resting beneath. Wine pairing: 2016 THIBAUD BOUDIGNON, CABERNET FRANC ROSÉ, LOIRE. One of our favorites pours of the evening was this delicious and fruity rosé from the Loire Valley. A vibrant pink color in the glass, this wine revealed flavors of fresh summer strawberries that were nicely matched with an almost grassy undertone. The perfect summer wine, it evoked Manet’s Le dejeuner sur l’herbe. COBIA, CORN, MARIGOLD: Three perfectly opaque slices of local cobia arrived atop a bed of brilliantly crunchy summer corn, all swimming in a bath of bright green marigold oil. Tiny snippets of tangerine lace (a delicate, feathery green) grown in McCrady’s rooftop garden garnished each slice of fish and lent additional depth and color to this vibrant dish. As with every other protein of the evening, the cobia was cooked to perfection, but everything played second fiddle to the amazingly sweet corn kernels. The only thing that could have improved this course was a slice of sourdough bread to sop up the remaining sauce. Wine pairing: 2015 LEITZ, RIESLING TROCKEN, RUDESHEIM, RHEINGAU. Leitz’s Riesling, a blend from several vineyards, was a wonderful expression of German Riesling. Gripping acidity faded out to reveal hints of wet stone and bright citrus fruit. Racy and clean, this was an excellent match for the cobia. 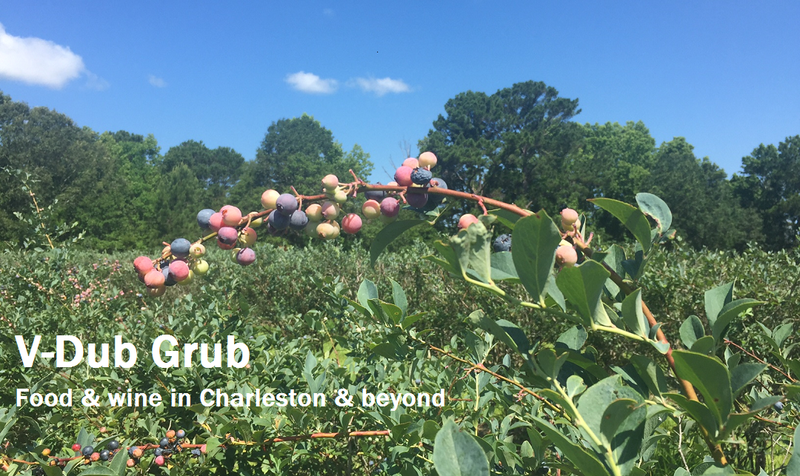 LIMPIN’ SUSAN: Described as the “mistress of hoppin’ john,” this course was almost too beautiful to eat. The base was a layer of expertly-prepared Carolina Gold rice, the grain that put Charleston on the map 200 years ago. Known locally as “Charleston Ice Cream,” the rice was studded with various herbs and edible flower petals grown in the restaurant’s rooftop garden. This dish represented everything that makes the new iteration of McCrady’s what it is: heritage South Carolina product, expertly prepared and plated as art. This is food that fills the heart and mind…if not necessarily the stomach. Wine pairing: 2016 MASSICAN, HYDE VINEYARDS, CHARDONNAY, NAPA VALLEY. A very expressive Chardonnay from the low yielding 2015 vintage, this single-vineyard white from Massican’s Hyde Vineyard was everything we love about the new, lighter Chards coming out of California. Rounded fruit notes with just a touch of richness paired well with the rice-based Limpin’ Susan. AGED BEEF, SOUR CABBAGE, FARRO: Simply put, this was medium rare steak at its peak. A thick slice of Tennessee-bred New York strip, deeply red from edge to edge, was accompanied by “fire-threshed” farro encased in a single leaf of sour cabbage. We both ate every bit of the richly flavored meat, right down to the meltingly tender fat cap. The farro and sour cabbage were of course well cooked, but didn’t seem to add much to the dish as a whole. Wine pairing: 2013 DOMAINE DU GROS NORÉ, MOURVÈDRE, BANDOL. Kermit Lynch is known for importing only the best, purest examples of French wine, and this Bandol red did not disappoint. The clay and limestone soil of Bandol gave great structure to the wine, with Mourvèdre’s expected dark fruit notes marrying well with the wine’s solid core of minerality. RASPBERRY SORBET, SUMMER FLOWERS, FERMENTED HONEY: The evening’s pre-dessert was a refreshing scoop of raspberry sorbet. This was a nice, tart follow up to the richness of the steak and tasted only of perfectly ripe late summer raspberries. That said, the dish was not without ceremony – after setting down our bowls, our server asked “white or pink?,” pulled out a pair of kitchen shears and proceeded to cut the petals off the one of the chrysanthemums that had been serving as a table decoration all evening. This trick was wholly unexpected, and the vegetal bitterness of the flower proved to be a nice counterweight to the fermented honey blended into the sorbet. CHOCOLATE, YAUPON HOLLY, BENNE: Before we received our sorbet, a server placed this dish on our tableside cart and slowly filled two chocolate shells with a steaming chocolate liquid. While we enjoyed the sorbet, the liquid cooled and solidified before being topped with five dots of benne oil and then served. What looked like a fairly pedestrian chocolate tart was transformed by the astringent bite of the oil. Not a combination we would have ever come up with ourselves, but it worked on every level and was a fantastic twist on a classic sweet. “FOIECHAMACALLIT”: This was hands-down Tyler’s favorite bite of the evening: two chocolate candies on a bed of cocoa nibs, served on a plate adorned with dried wheat stalks. Our server told us that Chef Brock’s favorite candy bar is the Whatchamacallit (a chocolate candy bar with a crispy layer of peanut butter) and so he created this interpretation, adding a rich mousse of foie gras and topping it with a single crystal of flaky sea salt. This dish tasted of each of its components: dark chocolate, sweet peanut butter and the fatty, umami-laden depth of the foie gras. Every ingredient was delicious on its own but also served to elevate all of the other flavors. This single bite was haute cuisine at its best: beautiful, ambitious, technically perfect and delicious. Wine pairing: RARE WINE COMPANY, HISTORIC SERIES – NEW YORK, MALMSEY, MADEIRA. A favorite drink in Charleston’s colonial era, our final pairing was a classic, nutty glass of Madeira. Made in a style intended to imitate the Madeira enjoyed two hundred years ago, the sweet viscosity of this oxidized wine was the perfect pair to the two chocolate desserts. BREATH FRESHENER: The final bite of the evening was a house-made breath freshener. The ingredients were not revealed, but we both sensed that the light and airy menthol meringue was slightly cut with a dot of berry compote. It tasted exactly like a Listerine breath strip and did indeed freshen your mouth after the two hour meal. It was an interesting and no doubt difficult-to-execute dish, though we considered the “foiechamacallit” the true end of the meal and this merely a coda. We absolutely enjoyed this meal and felt that it was well worth its very high cost. That being said, the experience was not above criticism, and there are a few things we think would have improved the evening. Other than the few not-our-favorite bites described above, our primary (though minor) complaint was with the timing. From start to finish, our meal was almost exactly two hours, and we could see patrons for the next seating being ushered to their seats as we were accompanied to a separate exit. While we understand that Chef Brock has choreographed the McCrady’s experience down to 5- minute increments, the end of the meal did come rather abruptly, and there was no offer of coffee or the ability to linger over any remaining wine. (While we opted for the standard wine pairings, McCrady’s wine list does include many heavy hitters in the wine world; we’d like to think that a table spending $1,000+ on a bottle of wine would not be shown the door at the two hour mark if the bottle wasn’t empty.) For a restaurant of this caliber and expense, some form of lounge would have been a welcome addition – a nice bar or leather chair where guests could finish their wine or enjoy coffee or a digestif would lend a final note of sophistication and relaxation to what was otherwise a beautiful, delicious culinary experience. Overall, though, we left McCrady’s satiated, inspired and toting a packet of heirloom seeds from Chef Brock’s private collection that was presented with our check – a fitting conclusion to a meal that celebrated and elevated Lowcountry dining and that could be found only here in Charleston. Earlier this year, we spent an incredible week eating and drinking our way through Bilbao and San Sebastián, Spain. In the Basque Country, pintxos (Basque for tapas), rather than traditional meals, rule the restaurant scene. It’s very common to hit up several spots in the course of an evening, having one or two pintxos and glasses of wine at each before moving on to the next stop. Our nightly pintxos crawls were the highlights of our trip, enabling us to try a huge variety of restaurants and food in a limited amount of time – essential in a foodie mecca like San Sebastián. Here in Charleston, we have a similar embarrassment of culinary riches. There are so many incredible restaurants in town, but with a three-year-old and two full work schedules, our time is fairly limited. So on our most recent date night, we decided to turn our evening into a pintxos crawl. We picked three favorite Upper King restaurants we hadn’t visited in a while, ordered small plates and wines by the glass at each, and then capped off our evening with a refreshing dessert at a new-to-us popsicle shop. It was a great – and delicious – change of pace (and palate)! With temperatures in the nineties and humidity to match, we knew we wanted to start our evening with something (or several somethings) COLD. The Ordinary – with its raw bar and impressive wine list – fit the bill perfectly. With two glasses of white firmly in hand (Muscadet for Nina and Chenin Blanc for Tyler, both French), we began picking our bartender’s brain on the evening’s oyster selection. With her advice, we went with an even dozen, divided equally (and in increasing order of potency) among Single Ladies from South Carolina, Savage Blondes from Prince Edward Island and Pemaquids from Maine. The local oysters were great, reminding us of the Ace Basin Blades we enjoy as much as possible during the “R” months (i.e., the typical South Carolina oyster season). The Savage Blondes, though noticeably smaller, offered a bit more salinity. Our favorites were definitely the Pemaquids, which had a nice heft and a good punch of saltiness. House-made horseradish, cocktail sauce, red wine mignonette and a seasonal cantaloupe mignonette accompanied the platter; each was delicious and enhanced the oysters in its own way. The Ordinary is one of our favorite spots to kick off an evening out, though it’s worth noting that the pleasures here don’t come cheap – our order came to $66 before tip, so we chose to continue on to for our second (and third) courses. That said, the oysters and wine were exactly the refreshing, light start to our crawl we’d wanted, and we definitely plan to return soon. After a thirty-second walk across King Street, we grabbed seats at The Grocery’s bar and ordered two more glasses of wine (a Spanish Granatxa for Tyler and a Californian rosé blend for Nina). We arrived right at the end of happy hour pricing for bar snacks, so we quickly ordered the shishito peppers and the burrata. The shishito peppers came exactly as we’d hoped, in the classic Spanish preparation: blistered on a screaming hot skillet, then liberally seasoned with quality olive oil and flaky salt. Needless to say, it didn’t take us long to reduce them to a pile of oil-stained pepper stems. The burrata dish came with a golf ball sized mound of the cream-laden cheese, surrounded by sauteed lunchbox peppers, black currants, slivered almonds and a simple herb salad. Toasted garlic bread served as a useful, delicious accompaniment and was quickly devoured after being slathered with cheese and heaped with the pepper mixture. We debated putting in an order for a second portion but instead decided to make our way southward along King Street. We again headed back across King Street to Indaco, which we were surprised to see was nearly full to capacity at 8:00 on a summer Wednesday evening. We quickly snagged the last two seats at the bar and ordered our final round of wine (a Vespolina from the Piedmont for Nina and a Nero d’Avola/Merlot/Syrah/Cab Franc blend from Sicily for Tyler). Indaco offers up a creative menu most akin to a classic Italian trattoria, with antipasti, pastas and wood-fired pizzas filling the menu. We don’t come here often (as we mentioned, so many restaurants, so little time! ), but we’re always impressed when we do. We originally planned to share a pasta dish, but after perusing the menu, we called an audible and went with the polpette and a grilled corn pizza. The polpette (Italian for meatballs) came out first and were nothing shy of fantastic. The meatballs were straight out of a nonna’s kitchen: slow braised in a San Marzano tomato sauce with a big hit of rosemary and a healthy dusting of Pecorino Romano. This was hearty and comforting fare, lacking only a few slices of bread to sop up the incredible sauce. Shortly thereafter, the pizza emerged from the wood oven with a bubbling and blistered crust, studded with grilled corn and sliced shishito peppers and covered in a thick blanket of mozzarella and Taleggio cheese. The unexpected preparation of the shishitos was delicious; their slightly acidic bite and heat perfectly counterbalanced the richness of the cheese, and the roasted corn added a nice, sweet crunch. Even after so many previous plates, we had no issue devouring the entire, generously-sized pie. After five dishes at three restaurants, we chose to end our evening with a quick, fun dessert. Crooked Crown, the brick-and-mortar outpost King of Pops (a local favorite popsicle cart), offers both alcoholic and non-alcoholic pops, cocktails with pops (next time!) and a small, rotating food menu. We went with boozy popsicles: watermelon mojito and apple cider. Light and refreshing, with both sweet and tart flavors and a noticeable but not overpowering punch of alcohol, they were the perfect accompaniment on our short walk back to the car through the humid Charleston air. Our pintxos crawl may have been more substantial and expensive than a similar jaunt through San Sebastián, but it was a great way to re-acquaint ourselves with a few of Upper King’s great restaurants. Even better, thanks to Charleston’s restaurant density, we were able to do maximal eating with minimal walking! We’ll definitely be trying it again soon – donde vamos la próxima vez? Tucked in the northwest corner of South Carolina, Greenville is a great little city with a big culinary scene. It’s an easy weekend getaway from Charleston, so last week we packed the car and headed to the upstate for three days of eating and exploring. While Greenville has outposts of several Charleston restaurants (like Halls Chophouse, Caviar & Bananas and soon Husk), we opted for spots we don’t have here at home – and whether new (or new-to-us) hot spots or old favorites, they were mostly very satisfying. Let’s dig in! We’ll confess that we chose Biscuit Head for our first breakfast in Greenville based largely on its name, but we’ll be back on subsequent trips for the food, too. A short drive from downtown, Biscuit Head offers a variety of (you guessed it) biscuit-based sandwiches and biscuit-and-gravy combos. There’s also a jam bar (genius!) where you can fancy up a plain biscuit with everything from traditional blueberry jam to more exotic offerings like raspberry chocolate, apple pie and funfetti cake. We were starving and knew we’d be skipping lunch, so we both opted for fairly substantial sandwiches. The fried catfish biscuit – served with spicy slaw, tomato, a poached egg and creole gravy – looked amazing. Unfortunately, we found that the creole gravy didn’t really work with the dish – its flavor clashed with that of the catfish, and it made the biscuit soggy and crumbly. The mimosa-fried chicken biscuit, however, was outrageously good. Served with sweet potato butter, sriracha slaw and a poached egg, the sandwich had the perfect balance of crunch, sweetness and heat. Since Friday was Bastille Day, we chose the charming Passerelle Bistro for dinner that evening. Passerelle offers classic French fare (including a kids’ menu) at the entrance to Falls Park. We’d been walking around in the heat all day (and had gorged ourselves on biscuits in the morning), so we opted for a simple dinner of crusty bread, butter and radishes, two Niçoise salads and a carafe of cold, crisp Muscadet. The crusty bread came out exactly as promised: four long slices of a hearty baguette, paired with a ramekin of quality salted butter. The radish portion of the dish was sadly rather lacking: we received 6 small slices, probably totaling one raw radish. We don’t normally equate quantity to quality, but in this case one radish per order does not an appetizer make. Radishes and butter are a classic French bistro appetizer, and these delivered on flavor – we just wish there were more of them. If you squint, you can see a sliver of radish. For our main course, we both chose the Niçoise salad, which was a delicious choice on a boiling hot day. Seared rare tuna came alongside hard boiled eggs, juicy cherry tomatoes and crisp green beans, all atop a mesclun mix. We’ve ordered this each time we’ve been to Passerelle, and will probably continue that tradition on our next visit. Though Passerelle’s prime location makes it a bit touristy, we’d definitely come back for a glass of wine and a bite to eat on the outdoor terrace on a cooler day! Saturday morning, we decided to forego a traditional breakfast in favor of a trip to Greenville’s incredible farmers market. Every Saturday morning from May through October, several blocks of Main Street close to traffic and open to pedestrians and a plethora of local farmers, food stands and artisans. After grabbing coffee from Methodical Coffee (which also supplies the coffee for The Harbinger here in Chucktown), we strolled through the market, enjoying the (relatively) cool temperatures and grabbing a few bites from several of the vendors. The local peaches were out of this world, and the bread and pastries from the Swamp Rabbit Café were delicious. We fought over the last few bites of a blueberry scone and had to restrain ourselves from devouring an entire loaf of stecca (an incredible Italian bread brushed with sea salt and olive oil) on the spot. We haven’t yet made it to the brick-and-mortar Swamp Rabbit Café, but it’s at the top of our list for our next trip. On Saturday night, we got a babysitter and headed out on the town for a few hours. Our first stop was Vault & Vator, a new speakeasy-style cocktail bar hidden in the West End. This was our kind of place: great drinks, knowledgeable bartenders, no TVs and no standing allowed! They also had a no-cell phone policy that we respected, so we don’t have any photos of our drinks – but our expertly-drafted rosé negroni and Hemingway daiquiri tasted as good as they looked (which is to say absolutely incredible!). V&V is a little too pricey to be an everyday spot, but it was the perfect starting point for our adults-only evening. Our absolute favorite restaurant in Greenville closed about ten days before our trip (RIP, American Grocery! ), so we decided to try The Lazy Goat, another of the city’s classic spots. We were lucky enough to get a window table overlooking the Reedy River, but unfortunately we were underwhelmed by our dining experience. We decided against the appetizer-entrée-dessert approach and instead ordered six share plates from the Mediterranean-themed menu: serrano ham, fried goat cheese, crispy Brussels sprouts, toasted garlic shrimp, Moroccan lamb, and goat cheese-stuffed piquillo peppers ($9-10 each). Perhaps we should have been more specific with our server, but we assumed the dishes would come out one or two at a time. Instead, three of the six appeared at our table five minutes after we ordered (and before our wine arrived), with the other three following only a few minutes later. Not only did this result in us eating a lot of lukewarm food, it made us wonder how much of the food was pre-made versus cooked to order. While several of the plates were quite tasty (the piquillo peppers and Brussels sprouts were particular favorites), the lack of pacing made it hard to truly enjoy them. Maybe we hit The Lazy Goat on an off night or our expectations were too high, but we won’t be back the next time we are in town. For Sunday brunch, we considered braving the lines at Biscuit Head for another fried chicken biscuit but decided on a sit-down brunch instead. Happily, Tupelo Honey Café offered the best of both worlds: complimentary biscuits and blueberry jam, plus a full menu of (mostly) Southern favorites. The “red flannel” hash, with salt-roasted beets, herbed potato cracklins, two fried eggs, horseradish crema and onions was an interesting but tasty take on a hash. The potatoes were cooked to perfection, with a great crunchy exterior yielding to a meltingly soft interior. The eggs were perfectly over easy, but we quickly destroyed them to allow the runny yolk to mix into the entire dish. The horseradish crema was a nice touch, but we would have appreciated a lighter hand when it was being applied; several bites had an unpleasant amount of kick and tasted of little beside the dressing. We also enjoyed the avocado toast & eggs. Under a heaping portion of avocado, farmer’s cheese, Aleppo pepper and a red chili honey drizzle, the toast was hardy enough to withstand its toppings but not so dense that it overpowered the other flavors. We left Greenville very sweaty, very full and very satisfied. We’ll be back soon to taste more of what this beautiful upstate city has to offer!